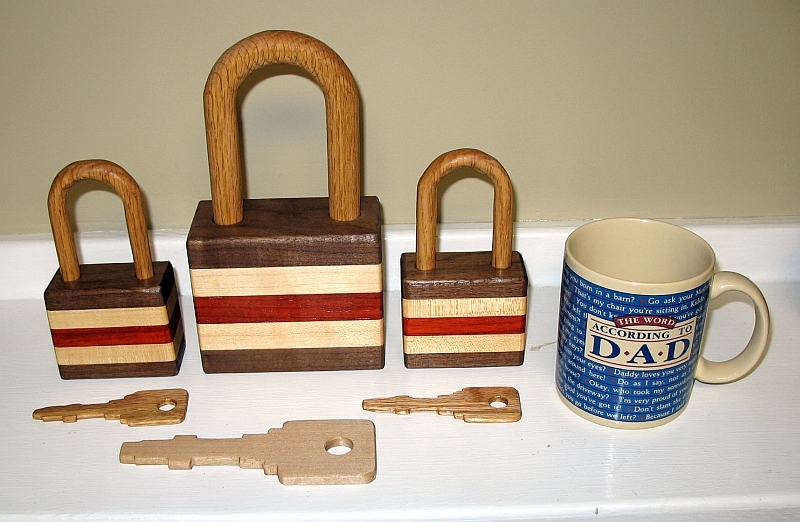 In early 2012, a young lady from Australia asked me to build 3 padlocks for her upcoming wedding. She wanted one large lock and two smaller locks. I entered the pattern for the padlock into Google Sketchup. 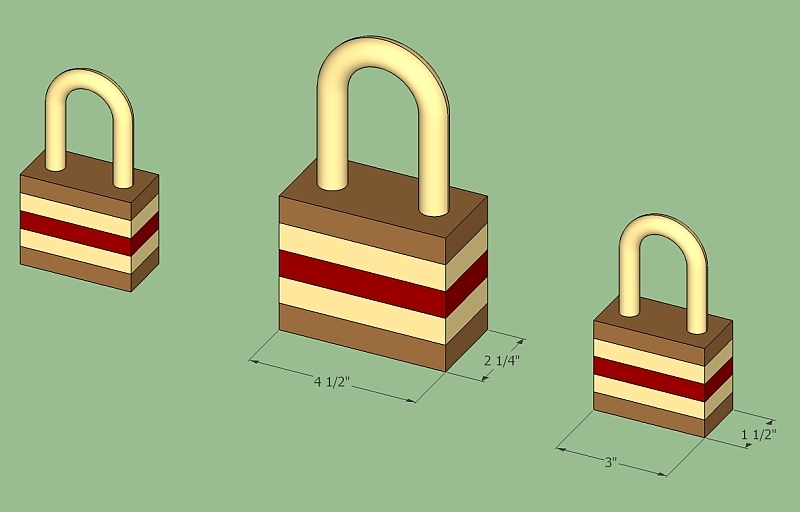 I then used Sketchup to scale the whole lock down by 66.6666 percent to create the design for the smaller padlocks. I selected this scale because it reduced the standard wood board thickness from 3/4" down to 1/2". I also did not want to go below 1/2" on the shackle since they are very fragile, even at 3/4" thickness. 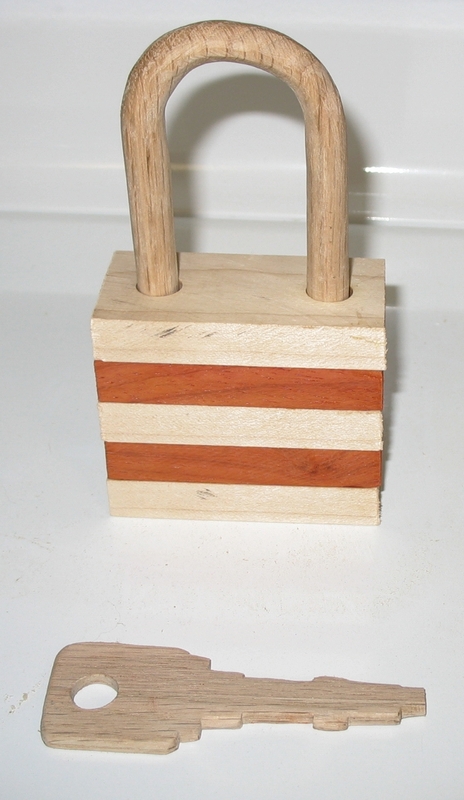 For the color scheme, I decide to use walnut for top and bottom, then 2 maple pieces, plus a red padauk piece for the middle segment. The hasp and key will be oak. Making the smaller locks could be a challenge, since I have never built this size before.........I have only built the full size model. Because I was making 4 small padlocks, I glued 3 pieces of brown grocery bag paper together, then glued the pattern on the top. I used the scroll saw to saw out the spring cavity versus a hand held jig saw. Make sure the ash springs do not extend vertically more than the top or bottom of the segment..........or they will bind when fully assembled. I bought the ash wood from Rockler online a couple years ago. I used the drum sander in the drill press to thin up the end that is glued to the segment. I number all the segments in pencil during the build process. I made the key edges round using files and a Dremel drum sander. Next was making the shackles. These were the most challenging parts because it is so easy to damage them while routing them with the round-over bit. I decided to leave extra stock on the bottom of the blank so I could hold them easily in the vise for sanding...I added 3 inches and made the blank 8 inches long. I also decided to leave the bottom connected versus separate to support the fragile curved tops better. I had one crack at the top using the 1/4" round-over bit (to create a 1/2" diameter shackle). I glued the pieces back together. I lost a couple of small chunks of wood on two others. If I was to make these again, I think I would not route the curved tops, just the sides. Then use the Dremel drum sander by hand to round over the top hoop. On one shackle, when I was testing it, the 1/8" dowel would not retain it as you swing it all around. I found the bottom of the shackle was not round. The missing material allowed it to come free during rotation. I sanded a flat spot on the shackle with the belt sander. Then I glued a piece of oak to the shackle. I used the Dremel with a drum sander to make it round again. 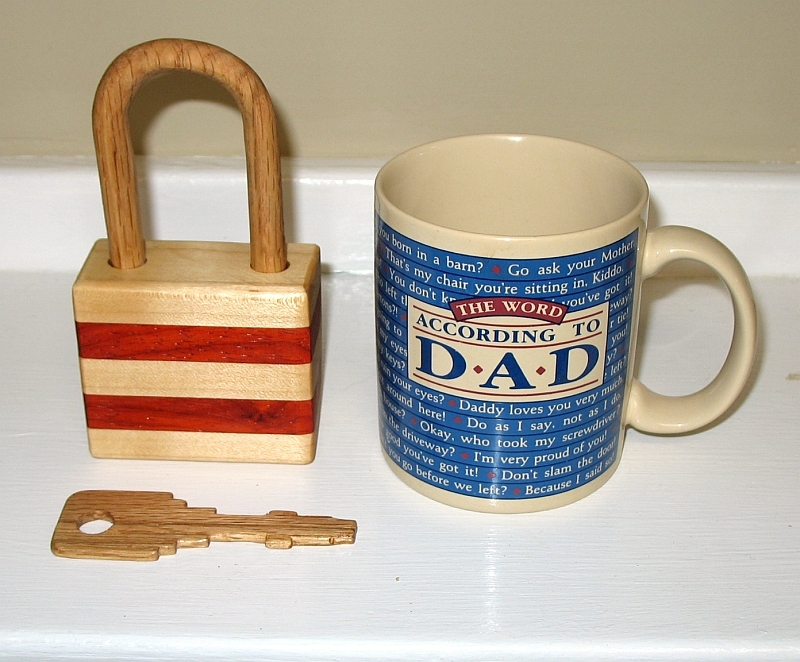 I added the extra stock on the shackle blank like the small padlock. I cut the shackle on the scroll saw from 3/4" thick red oak. I used a 3/8" radius round-over bit to form the round cross-section. I was careful feeding the blank into the router and it worked perfectly. 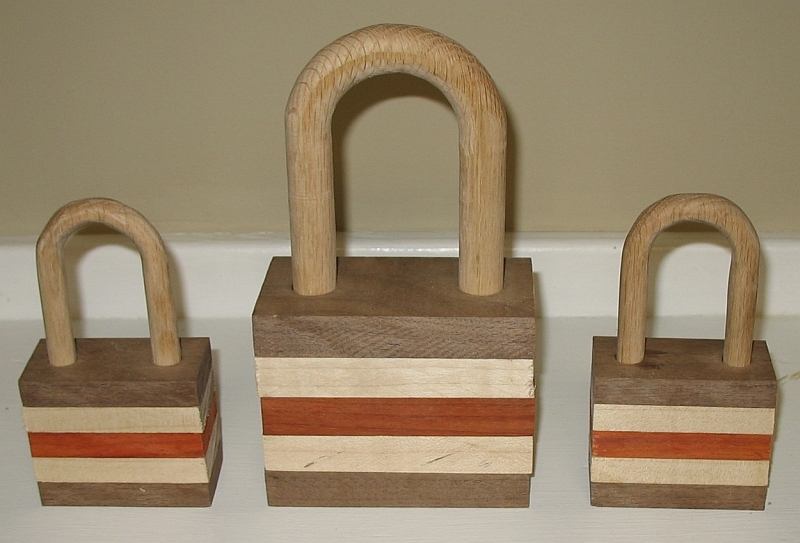 Since I had only built the large size padlocks before, I was not sure I could scale them down to 2/3 size. I was able to scale them ok. The 1/2" diameter shackles are very fragile. It might be advisable to try laminating some wood strips with the grain in different directions to make a stronger shackle on future locks. The lady in Australia who used my locks in her "locking ceremony" or wedding, sent me a nice email, including photos of how they used my wood locks. Thank you so much for the beautiful locks and for your follow up! unfortunately we were unable to get married on the day that we had chosen as my brother passed away suddenly. However, we have since got married and while the location was not as nice as we had originally hoped for, the ceremony with your locks was beautiful. We locked the smaller locks representing our two children onto the larger lock and then locked them together for life. We then tied the keys to balloons and let them go so that the locks can never be broken. It was a truly unique way for my family to celebrate. Pretty cool that these wood padlocks were made in my workshop in Fairbury, Illinois and then used in a wedding ceremony in Australia! !